Both of these companies are tackling the $6 trillion Internet of Things market. Sierra Wireless (NASDAQ:SWIR) and CalAmp Corp. (NASDAQ:CAMP) have set their sights on the growing Internet of Things (IoT) -- where formerly unconnected devices are connected to the Internet. It's a market expected to generate more than $6 trillion in revenue and cost savings by 2025. These two companies have both invested their resources into building some of the most sophisticated hardware, software, and services for the IoT. But which one looks like the better long-term bet? To answer this, let's take a quick look at what both of the companies are doing in the IoT market and how they're performing right now. CalAmp divides its revenue between its telematics business (which includes hardware) and its software and subscription services. For example, CalAmp sells routers to its customers, including industrial equipment giant Caterpillar, so that they can bring their devices and equipment online. But then CalAmp goes a step further and sells analytics software and cloud-computing services to it clients as well. This marriage of hardware and services has created a strong IoT ecosystem for the company. CalAmp now connects more than 20 million devices to its services and has more than 730,000 subscribers. The company's sales weren't as impressive as they could have been in the fiscal 2018 fourth quarter, though. Telematics sales grew 29%, and software and subscription services were up 5.8% year over year. Total sales grew by just 9.6% in the quarter. 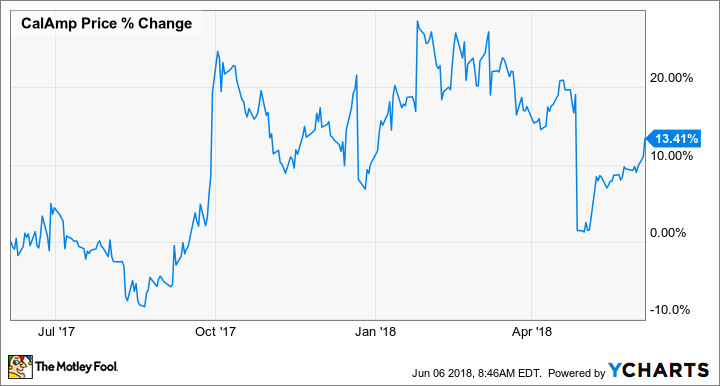 But potential CalAmp investors should remember that the IoT is still a burgeoning industry that has plenty of room for more growth, and CalAmp's moderate growth in the most recent quarter doesn't necessarily reflect its full long-term potential. The company has done a fantastic job building out sales with its most important customer, Caterpillar, which accounted for $11.6 million of the company's total revenue in the quarter. CalAmp's shares are also trading at an alluring 15 times the company's forward earnings. That makes the stock relatively inexpensive compared to the overall tech industry. Investors should remember that the company's relatively small size (its market cap is just $760 million) and its big bet on an emerging tech trend mean that it could experience more volatility ahead. Like CalAmp, Sierra Wireless makes devices that connect things to the Internet. Sierra's wireless chips (everything from Bluetooth connections to 2G, 3G, and 4G modules) dominate the embedded wireless market. Sierra believes that it has the potential to use its hardware and services to tap into a $30 billion addressable market in the IoT by 2021. Right now, the company still makes the vast majority of its revenue from its hardware sales. Sierra's OEM solutions segment (which includes embedded module sales) was up just 2% to $135 million in the first quarter 2018, but sales for its enterprise solutions segment (gateways and routers) were up 34% to $29.2 million. One of Sierra's biggest opportunities right now is coming from its IoT services segment, which saw its sales skyrocket 218% from the year-ago quarter to $22.5 million. Much of that growth came from Sierra's 2017 purchase of Numerex, a leading provider of enterprise solutions. The acquisition has give the company lots of opportunity to bring in recurring revenue from the IoT market, in addition to IoT hardware sales. The combination of both hardware and services should help the company continue to build out its IoT position as the Internet of Things grows. Sierra's total sales were up a healthy 16% to $186.9 million in the first quarter. But despite the solid quarter, its share price is still down about 40% over the past 12 months. 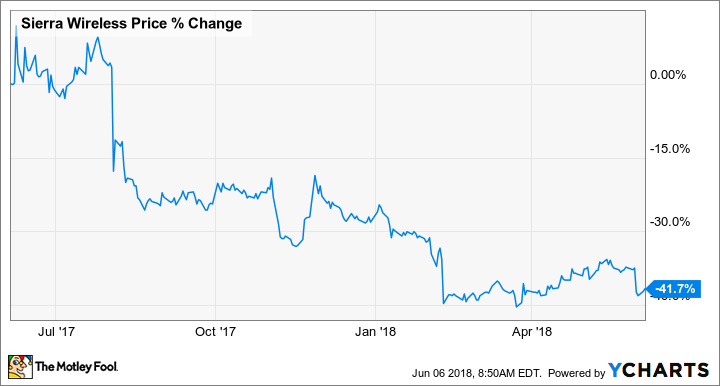 Investors may want to take note, however, that Sierra's stock is trading at just 14 times the company's forward earnings, making it cheap compared to most of its peers. While both companies are doing a fine job building out their IoT business, my better-buy pick is Sierra Wireless. The company's three main revenue segments make Sierra far more diversified than CalAmp, and its recent acquisition of Numerex has given Sierra a strong IoT services business that should see continued growth. CalAmp still has lots of potential in the IoT, but the mix of OEM solutions, enterprise hardware, and IoT services gives Sierra a slight edge over its peer.